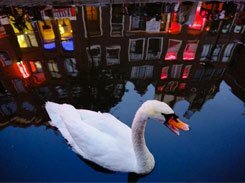 While most attention in the Red Light District in Amsterdam (the Wallen) goes to the adult stuff - it's okay, we understand - people forget that the area has a lot more to offer than just prostitution and brothels. The Amsterdam Red Light District in Amsterdam is among the oldest parts of town, and has some of the finest architecture and canals of the whole city. 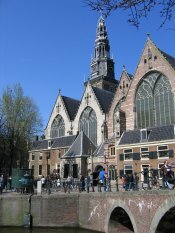 This church, the oldest remaining building of Amsterdam (built around 1300 AD), is located paradoxically in the heart of the Red Light District in Amsterdam. You can visit the church seven days a week in the afternoons. Many famous Amsterdammers were married here or are buried inside the church. It has a magnificent 18th century organ, and in the summer months organ recitals are held. Furthermore, it's used for various art exhibitions, including the world-famous annual World Press Photograhpy awards. It's still used for church service: each Sunday at 11am. 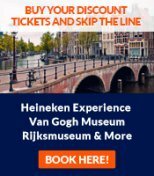 Now a highly interesting museum, Our Lord In The Attic (Ons Lieve Heer Op Solder, also called the Museum Amstelkring) is the only remaining clandestine Catholic church of Amsterdam. After the (Calvinist) Netherlands declared themselves independent from the Spanish (Catholic) empire in 1581, Catholic church meetings were only 'tolerated' if churches were hidden from public sight. The 16th century interior of this beautiful church has been kept intact, and is now used as a museum showing temporary exhibitions connected to the theme of the church. But since recently, it's been in use for Catholic church services as well. Marriages take place here, and during the winter months Mass is held on the first Sunday of the month at 10.45am. The large Nieuwmarkt square has been in use since 1614 AD as, among others, a cattle market. The market function has been reinstalled recently: there are markets everyday, with a biological market on Saturday and, during the summer months, an antique and book market too on Sundays. 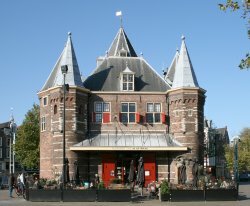 Around the Nieuwmarkt, there are pubs and restaurants, and on the Nieuwmarkt square is restaurant In De Waag, in an impressive, castle-like building from 1488 AD. It's one of those restaurants you go to for the building and the atmosphere, instead of the food. Sometimes nicknames Chinatown, this area also has a lot of Chinese restaurants, stores and companies, reason why the street signs are both in Dutch and Chinese. The Zeedijk is the street between the Red Light District in Amsterdam, and the Central Station. Once among the most notorious streets of the country because of it's many drug dealers and heroine junkies, the street has been thoroughly cleaned up. Now, it's a lovely street full of exotic eateries (especially try the Malaysian eateries) and shops. Partcilarly noteworthy at the Zeedijk is this Buddhist temple of the Fo Kuang Shan organization, built in Chinese palace style, and the biggest in it's category in Europe. It was built on the last remains of Medieval Catholic monastery. The building in yellow, red and blue-purple colors is a remarkable contrast with the rest of the Zeedijk. 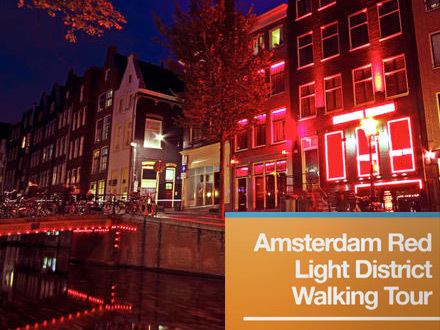 It's another major religious building in the heart of the Red Light District in Amsterdam. 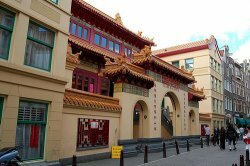 At the core of the temple is the Guan Yin Shrine. You can light an incense stick here - please make a donation. Especially on Sundays, but irregularly also on other days, there are services where the sutras (sayings of Buddha) are recited. This is open to the public.